Some time back, I read a story in my newspaper in which a famous actress was bewailing the fact that Hollywood wasn't calling anymore. It seems that once she had reached 'a certain age' the roles that she once played no longer came to her, but went to younger women. I think I read this and thought (to myself), "Lady; if you had what they wanted, they would be calling. You had a good run. Now get over it, and take up basket weaving, or something ..."
I had an experience this afternoon though, that makes me slightly more sympathetic to her plight. 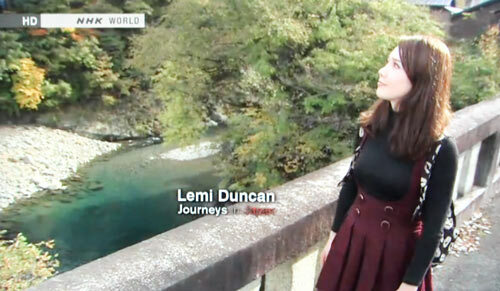 About three months back, I received a call from a TV producer at NHK, offering me a job as host for yet another episode of their 'Journeys in Japan' series. I have done a couple of these for NHK before, and was very pleased to find them 'coming back for more'. I must have done well in the previous episodes! I strutted around the workshop for a while, feeling - now having been hired three times for this program - that I was becoming accepted as a 'regular' host. Alas, it was not to be. She called again a few weeks later, and I could tell instantly from her apologetic tone that there was a problem. It seems that the executive producers were thinking of some changes, and she said that the program status was now changed to 'pending'. I was free to use those dates for something else, and she would call me back again when things had been re-scheduled. OK, no problem. These things happen, and I just kept on with my normal work. This afternoon though, realizing that it was the day that the weekly Journeys program is broadcast, I tuned in, to see where they were visiting this week. Whoa! It was that same town. It seems that it hadn't been the program that was shelved, it had been their choice of presenter! We were guided around the town by a very young and beautiful host. And I mean very young, and I mean very beautiful. Wow! I have to say right away that she did an absolutely excellent job. I think that some of her 'voice to camera' work was a bit wooden, as she was perhaps reading from a cue card, but that is a small quibble. She was eager and enthusiastic about the things she showed us, and made everything very clear. And boy, did she look good! So 'old' Dave has been replaced by a beautiful girl younger than his own daughters. How does he feel about this? As you might expect, I have mixed feelings; I can't argue with their choice at all, but I of course don't want to think that this is the 'end of the line' for me. All I can do is wait to see if they ever call me again. And I can clutch at one straw - the young lady did a scene where she strolled through the town wearing a very elegant kimono made from fabric woven by one of the craftsmen she visited. Ah! So that's the reason they chose her over me. It was simply because I can't do a kimono scene! So of course they'll be calling me again ... very soon, I'm sure.